Gopalbhai Patel, a 51-year-old farmer of Bagthala village in Rajkot district of Gujarat, has always looked at the skies in monsoon, wishing it to rain copiously so that he can grow his crop. Unlike farmers in states like Uttar Pradesh, Haryana and Punjab, his dependence on monsoon rain is more due to the poor availability of groundwater and irrigation facilities. “We have one harvest season. If water is available till March or April, we can go for a second crop,” says Gopalbhai whose eyes light up at the mention of the Saurashtra Narmada Avtaran Irrigation Yojana (SAUNI), a pet project of prime minister Narendra Modi, which he inaugurated on August 30. In Saurashtra, dams have insufficient water and the natural reservoirs are practically dry as the region receives scanty rain. Though the region has 471 major, medium and minor irrigation dams, 63,000 check dams, 73,000 farm ponds, the water scarcity persists. Saurashtra is the south-western part of Gujarat, and includes Rajkot, Jamnagar, Junagadh, Bhavnagar, Porbandar, Amreli, Surendranagar, Dwarka, Morbi, Gir Somnath and some portions of Ahmedabad and Botad districts. Spread over 60.95 lakh hectares, the region receives 500 to 800 mm rainfall annually and has dry and humid climate. SAUNI (‘for all’ in Gujarati) is a Rs 12,166 crore project. Modi opened the gates of Aji III dam at Khajuradi village in Rajkot giving hope to farmers of 105 villages of perennial flowing water. The project would eventually harness excess rain water that was going waste, and make it flow through the Narmada main canal, changing the face of at least 900 villages. The Narmada main canal is the biggest lined irrigation canal in the world. The 458 km canal that starts at Kevadia Colony in central Gujarat and runs along the Gujarat-Rajasthan border would eventually be filled to the brim at the completion of the SAUNI project. An engineering marvel, the canal is lined with plain cement concrete to minimise seepage losses to attain higher velocity and to control water logging in future. Such a large-scale paving of concrete lining has been done for the first time in India. SAUNI was the idea of Modi, when he was the chief minister of Gujarat. He had envisioned to utilise the excess flood water of the 1,300 km Narmada river that originates in neighbouring Madhya Pradesh for parched Saurashtra. At the inauguration ceremony, Modi recalled the day when he had first met lawmakers from Saurashtra and discussed the project with them. “On September 25, 2012, I made a presentation about the SAUNI project in Rajkot during a programme organised to celebrate the birth anniversary of Pandit Deen Dayal Upadhyay. All the representatives of Saurashtra region present in the hall were surprised to know about this scheme and felt that it can never be accomplished,” said Modi. 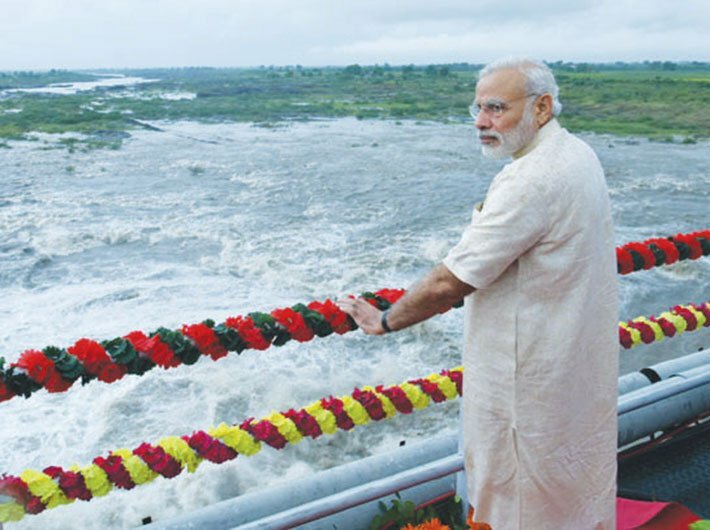 Gujarat has been receiving Narmada river water via the Saurashtra branch canal of the dam. The canal then breaks into six smaller canals: Maliya, Vallabhipur, Dhrangadhra, Morbi, Limbadi and Botad. The main canal receives almost one million acre feet of water, which, at the end of the project, will get doubled and replenish the natural and man-made water bodies. The project has been divided into four links covering 1,126 km of Saurashtra through 115 dams. So far, 16 dams have been constructed. Executing the project has not been easy. Narmada water is being brought from the Machhu dam to the 76.73 feet high Aji III dam. The Machhu dam is connected to the Morbi sub-canal of the Saurashtra main canal. From Machhu, newly set-up high capacity turbine pumps lift water to Aji III, a 38-km twin pipeline, for the dam. “From Machhu, using eight turbine pumps, which can pump more than 20,000 litres of water per second, the water is pushed through twin pipelines to Aji III dam,” said Ashok Kumar Sharma, associate vice president of Megha Engineering and Infrastructures Limited, which is constructing the project with the Gujarat government. This has rejuvenated the Aji river, which, over the years, had turned into a dry patch due to low rainfall. Currently, from Aji III, water is again being pumped to Und dam through a 21-km pipeline. This together with the proposed 120-km pipeline to be laid from Und to Sani dam will cater to the needs of 175 villages. In the next three years, the SAUNI project will bring water to 972 villages. Currently, work is on on Machhu-Sani dam, Limbdi Bhogavo-Raydi dam, Dholidhaja dam-Venu dam and Limbdi Bhogavo dam-Hiran dam links. “As many as 163 villages will be benefitted after the phase 1 of all the four links is completed,” said AD Kanani, superintending engineer of the state irrigation department. As per a study done by the Gujarat government, Saurashtra requires 4 to 5 million acre feet for irrigation. Harnessing extra water from the Narmada river will therefore help in bridging the existing gap in requirement and availability. At completion, SAUNI will turn additional 11 lakh hectares of saline, black alluvial soil of Saurashtra into rich and cultivable land. At present only 42 lakh hectares is cultivable. Hopefully, in future, farmers here can grow cash crops like cotton, groundnut and sesame in July and harvest the crops by October-November. The SAUNI project is ambitious but a few questions are also being raised about its efficacy. The power consuming turbine pumps at Machhu dam alone will add an extra burden of Rs 8 crore per month as electricity charge to the state exchequer. This works out to the tune of '96 crore per annum. At the end of the project, many more pumps will be installed to lift water from 115 dams on the network. The cost involved in power usage is going to be mind-boggling. How will the state fund such an expensive project? Will it pass the burden to the taxpayers or the users? Apparently, the state is yet to work this out.